One of the most elusive and controversial figures in NASA’s history, George W. S. Abbey was called “the Dark Lord,” “the Godfather,” and “UNO”—short for unidentified NASA official. He was said to be secretive, despotic, a Space Age Machiavelli. Yet Abbey had more influence on human spaceflight than almost anyone in history. His story has never been told—until now. The Astronaut Maker takes readers inside NASA to learn the real story of how Abbey rose to power, from young pilot and wannabe astronaut to engineer, bureaucrat, and finally director of the Johnson Space Center. During a thirty-seven-year career, mostly out of the spotlight, he oversaw the selection of every astronaut class from 1978 to 1987, deciding who got to fly and when. He was with the Apollo 1 astronauts the night before the fatal fire in January 1967. He was in mission control the night of the Apollo 13 accident and organized the recovery effort. Abbey also led NASA’s recruitment of women and minorities as space shuttle astronauts and was responsible for hiring Sally Ride. Written by Michael Cassutt, the coauthor of the acclaimed astronaut memoirs DEKE! 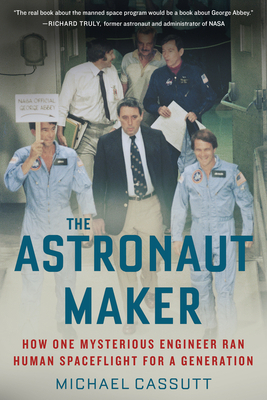 and We Have Capture, and informed by countless hours of interviews with Abbey and his family, friends, adversaries, and former colleagues, The Astronaut Maker is the ultimate insider’s account of ambition and power politics at NASA. Michael Cassutt is the coauthor of DEKE!, the autobiography of astronaut Donald K. “Deke” Slayton, and We Have Capture, the autobiography of astronaut Lt. Gen. Thomas Stafford, and the author of three editions of Who’s Who in Space (1987, 1993, 1999). He has also written eight space-themed novels and thirty short stories published in Isaac Asimov’s Science Fiction and elsewhere. As a television writer and producer, Cassutt has been a member of the writing team of a dozen different series, from The Twilight Zone to Max Headroom to The Dead Zone. He is currently co–executive producer of SyFy Channel’s series Z Nation.